…plus so many other connections and friends who’ve helped me to sustain my energy this year, in particular via Twitter. Special mentions go to my Boss @jmun31 who has heartily embraced the 2.0 world, and to @MaralynParker who generously replies to many of our education tweets, and keeps debate flowing. This entry was posted on December 1, 2009, 7:22 pm and is filed under online tools, social media. You can follow any responses to this entry through RSS 2.0. You can leave a response, or trackback from your own site. Great choices Kelli. Love the positive vibes of voting for favs. I’m going to be checking all of these out based on your recommendations – thanks! Kelli, I appreciate your generosity – thankyou! Hi Kelli, thanks for the nomination – really appreciate it. 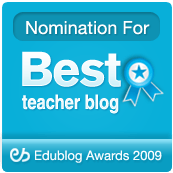 I also look after the Edublog Awards nominations and just needed to check that you have done the second step. Only asking because I haven’t seen an email from you come into the email account. Thanks Kelli. I have just tweeted that these Eddies nominations aren’t some soppy goodwill, they embody what is best about human networks. I sincerely hope we bump into each other one day soon, I got a feeling we won’t shut up from sharing stuff and having a laugh and a war story or two to share. Cheers & thanks again, much appreciated. Am finding more time now it’s holidays to read more people’s blogs and I am loving all the people I can connect with. Keep up the great work.